Marcus Katz teaching at the launch of TV show Witches of Eastwick. Are you looking to have an in-depth and creative Tarot Reading of your spiritual and everyday life? A positive review of your opportunities for a clearer future? Perhaps you have reached a turning-point in your life, and are looking for a totally new viewpoint? Or maybe you wish to elegantly prepare for (or recover from) a significant life event? 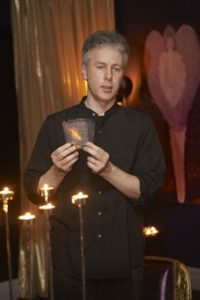 Have a Tarot reading now by author Marcus Katz, one of the worlds most experienced tarot readers and teacher. You can be assured of a confidential and comprehensive reading by a reader who is also a licensed NLP Trainer with thirty years experience of NLP and Tarot. Over the last three decades, Marcus has worked with and taught the widest range of people including horse-whisperers, dentists, teachers, doctors, even helicopter pilot trainers, to perfect his art. He has provided over 10,000+ face-to-face tarot readings for clients and taught tarot across Europe, the USA, Asia-Pacific and Australia. He is a #1 top-selling author over 30 Tarot books, including the award-winning Around the Tarot in 78 Days (Llewellyn, 2012) and the forthcoming Tarot Time Traveller (Llewellyn, 2017) both with co-author Tali Goodwin. His first book, Tarosophy, was hailed as a break-through work and a “significant contribution to the tarot tradition” by Rachel Pollack, Mary K. Greer and Lon Milo Duquette amongst many other tarot teachers. Marcus is co-director of the world’s largest Tarot Association, and co-founded the largest tarot discussion group in the world with over 28,000 participants. He is often the first choice for many Tarot Readers when they want a Reading. The experience of over 10,000+ readings over three decades. Your question will be considered deeply and profoundly as a unique experience in the context of your life. The reading will be performed in recognition of the importance of your situation. An innovative and unique reading – tailored specifically for your question. Marcus is able to create spreads and methods at the moment of your reading, which capture the spirit of your question and frame the answer in terms you will immediately recognise. A spiritual appreciation of even the most apparently mundane questions. As a practitioner and teacher of the Western Esoteric Initiatory System, Marcus will elevate your question to take into account your whole life path. Academic Knowledge + Intuitive Wisdom. Whilst Marcus has a library which contains most materials written on Tarot over the last century, he maintains a sense of humour, common-sense and intuitive style which informs your readings. All readings are recorded to video and sent to you as a download link. The Year Ahead and Grand Tableaux readings are 45-55 minutes in length. The Sleeping Beauty reading is sent as a written PDF. In this innovative method, Marcus will unlock your spiritual slumber for a new awakening, leading you to your own path in life. Discover how to access your spiritual life and deepen your experience of your world in the midst of the everyday. There is nothing like the kiss that awakens sleeping beauty – experience it now for yourself. This unique method is brief yet powerful and your reading will be sent by PDF within 7 days. A three-card reading from the very literal Lenormand, with interpretation based on the entire history of this divinatory system from dream symbols, coffee grind reading and cartomancy. Using Marcus’s own “Year Ahead with Twist” method to provide a key to unlocking the most out of every month throughout the whole year. A very popular reading with regular clients, limited places per year, please book in advance. You will receive your reading by full video. Limited slots available during December-January! Detailed Reading for any specific situation or a general question, using a selected spread and deck (including Tarot, Oracle and Lenormand) for your reading from thousands of possible choices. A full and comprehensive reading of every aspect of your life and future with the entire 36-card Lenormand deck. You may ask specific questions of the past and future within this reading which covers all areas of your life. Marcus was the first person in the world to receive a Masters Degree in western esotericism at the University of Exeter and is currently working on a 10-volume lifetime work on the Western Esoteric Initiatory System, The Magister. You can discover more of the Western Esoteric Initiatory System in the Crucible Club. He is co-Director and Course Teacher of Magicka School, offering courses in Wicca, Tarot, Kabbalah, Alchemy, Spellcrafting and Egyptian Magick. He also offers the Fires of Azrael course at Magicka School which teaches the life and work of Dion Fortune. Marcus was initiated into Gardnerian Witchcraft when he was 18, and worked daily for more than a decade in that tradition. His research gives him access to rare and unique materials, including many unpublished works on Tarot and Kabbalah. He has presented at the Golden Dawn Conference in London, the PCA/ACA conference in New Orleans, and teaches across the world. Marcus has taught alongside leading authors and teachers Mary K. Greer, Lon Milo Duquette, and Rachel Pollack, and presented at events worldwide. He co-organised organised the Tarosophy TarotCon events worldwide for seven years and taught at the prestigious Omega Institute, New York in Spring 2011. With his co-author Tali Goodwin, he recently made a ground-breaking discovery of A. E. Waite’s second Tarot, publishing the images in the historic Abiding in the Sanctuary. You can read the Tarosophy Code of Conduct, Ethics & Performance (which was created by Marcus and is now used by many hundreds of Tarot Readers) which assures you of the best standards in the world, including ethics, confidentiality, etc. There is a strict no refund policy for readings once the reading has been conducted. For all enquiries, please contact our P.A. at pa@celestialcanopy.com.